We don’t know much about the origin of the Piazza, but we do know that it did not originate from this world. 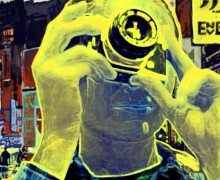 Perhaps a different time, even a different dimension. They were magic, intergalactic Guides, traversing space and time. Different, otherworldly, they often sought out, protected and guided those also not from this world. How they arrived here is not known, but one theory is that a great being of magic placed a blueprint in the mind of Italian artist and car designer, Giorgetto Giugiaro, who, naming it the ‘Asso di Fiori’ (Ace of Clubs) and dubbing it his fifth ‘Copernican revolution’, broke rules and conventions with the design. In 1979 the world marvelled at his radical, beautiful new creation, and Isuzu gave it physical form, creating these futuristic vessels of optimism and imagination for over a decade. As the legend goes, each one was endowed with a metaphysical essence, a Guide, that would remain on Earth as long as this body lasted. Every one that disappears means a Guide cannot exist on Earth any more. I felt I had arrived here with one. When their body was damaged and taken away, I thought I was stuck here forever. I thought there were none left, that they had all fallen into disrepair and quietly faded from existence. But they hadn’t. They are there, incredibly rare, wandering the wilderness of the present day, many with their magical essence dulled by abandonment and loneliness. Refugees, seemingly invisible to those that see simply another decaying machine. They are a flight of the navigator: in exhange for your guardianship, they will be your Tardis. 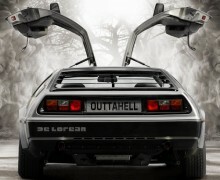 They were the concept car that inspired the DeLorean itself. They will take you to the past or the future, to solitude or great adventure – like many things in life and beyond it, they will take on the life you create in them, the beliefs you have in them. For the muggle version of the history of the Asso di Fiori design and concept (later known as the Isuzu Piazza, Isuzu Impulse and Holden Piazza), this strange thing about which I have a Problem, see below. Flashback to the Italdesign stand at Geneva Motor Show in 1979, and crowds are gathered to see the new concept car, the Asso di Fiori (‘Ace of Clubs’). It’s a real revolution in automotive design, described by its designer Giorgetto Giugiaro as his fifth ‘Copernican revolution’, for reasons outlined below. The Isuzu 117 coupe was designed in 1966 by Giugiaro at Ghia and developed by Ital Styling, then mass produced from October 1968 onwards. 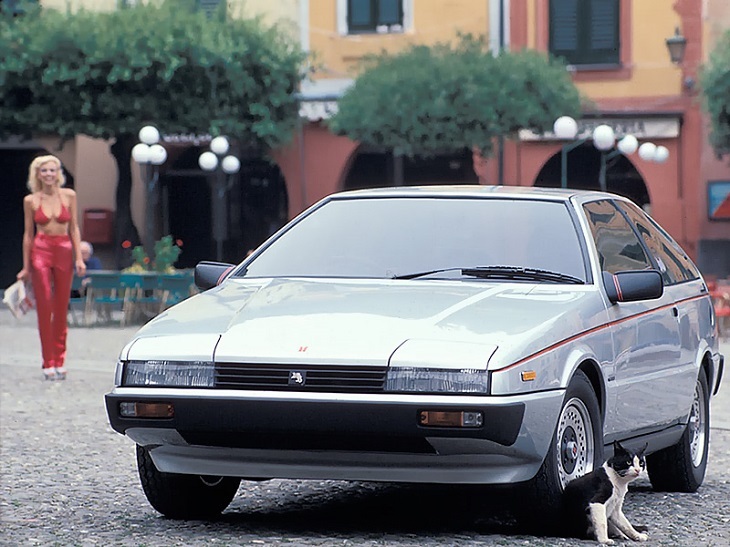 After this, Isuzu management then decided to entrust Giugiaro with the design of this car’s successor, giving him a completely free hand (aside for one condition which was to use the technical platform of the Gemini 1800 (the Japanese version of the American Chevrolet Chevette platform)). The manufacturer would not interfere with the design development phase, but would wait to view the finished prototype to decide on mass production follow-ups. The result was the Asso di Fiori. Here, through the complete faith placed in him by Isuzu, and his own internal need for a new approach to shapes form language, Giugiaro had unleashed his creativite genius. Italdesign’s stand at the Geneva Motor Show was perennially swelling with people: journalists, designers, and manufacturers all came to see what Giugiaro had “been up to” this time. They weren’t disappointed. The Asso di Fiori was his fifth ‘Copernican revolution’: after pioneering the radiator grille with incorporated headlights (Alfa Romeo 2000 Sprint, 1960), bonded windows (Alfa Romeo Canguro 1964), built-in painted bumpers (Asso di Picche, 1973), and cut of the hatch wrapping onto the sides (Volkswagen Golf, 1974), Giugiaro had this time collected new and previous innovations into one mass producable design. Exterior drip channels eliminated, all flush-fitting windows, limousine doors and rear hatch were three ideas that had already been glimpsed at individually both on his earlier prototypes and, partially, on other cars. What was extraordinary about them here was that they were all worked in together and were technically feasible. 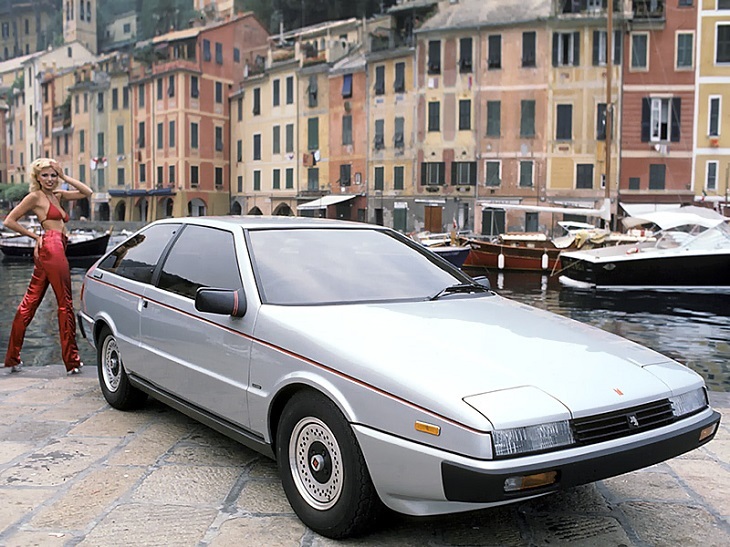 Aldo Mantovani (co-founder of ItalDesign) believed at once in these radical choices of Giugiaro’s and gave it his all to make them mass producible. Needless to say, the Isuzu management appreciated the car. They literally fell in love with it, and the Show prototype was flown directly to Japan. Within forty-eight hours, still at the Show, they were given the ‘OK’ to go ahead with the car’s development, entrusted to Mantovani and his team of engineers, who were asked to fast-track the development. Talking about the Piazza (as it was to be dubbed in mass production) to the Italdesign engineers means rekindling a nightmare. Urged by Mantovani and by the Japanese, who out of their enormous respect for Giugiaro, requested that every modification be approved in writing (even the substitution of the diameter of the washer or the movement of a switch on the seat) they went non-stop for almost two years. 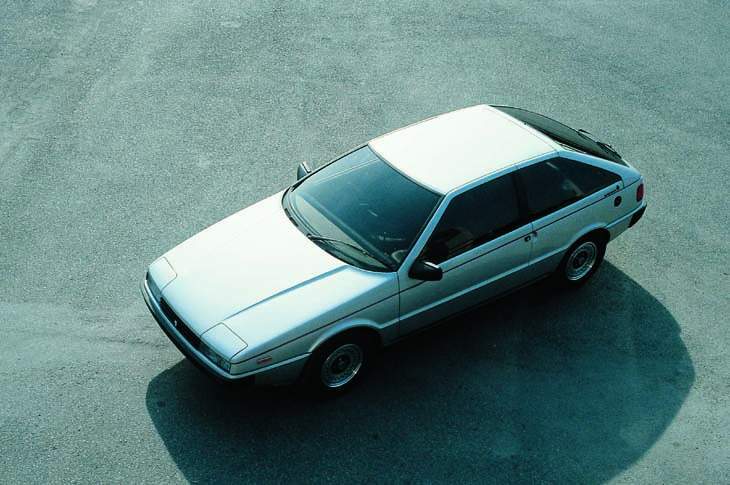 Nevertheless, this effort would bear its fruits: at the Geneva Motor Show of 1981, exactly 24 months from the Asso di Fiori prototype, Italdesign showed the first pre-production model of the Piazza. Regular production was to get off the ground two months later in May. In recent history, these times practically set a record. What this “Copernican revolution” says in terms of form, shape and styling deserves thorough analysis, both of Giugiaro’s motivations and of the influence it was to have on mass production cars. His technical and sylistic solutions were to be adopted for production cars the world over from that point onwards: for example, the 1987 French Revue Automobile records that 1/3 of cars produced from 1981 and 1987 were designed with total doors like Asso di Fiori. The Turin designer’s approach to this new period in shape grew from the combination of aerodynamic demands that called for flowing surfaces and smooth connections, and his need for a strict simplicity in graphic touches. The outside drip channels, source of considerable aerodynamic turbulence especially around the A-pillar, were eliminated and substituted by a gutter built into the door rabbet strip. An ingenious solution, easy to imagine theoretically, but that required arduous design and testing to make effective. The strip (also a gutter) had to be hidden in the connection between roof and side along the entire length of the door cut, as well as being extended onto the A-pillar. 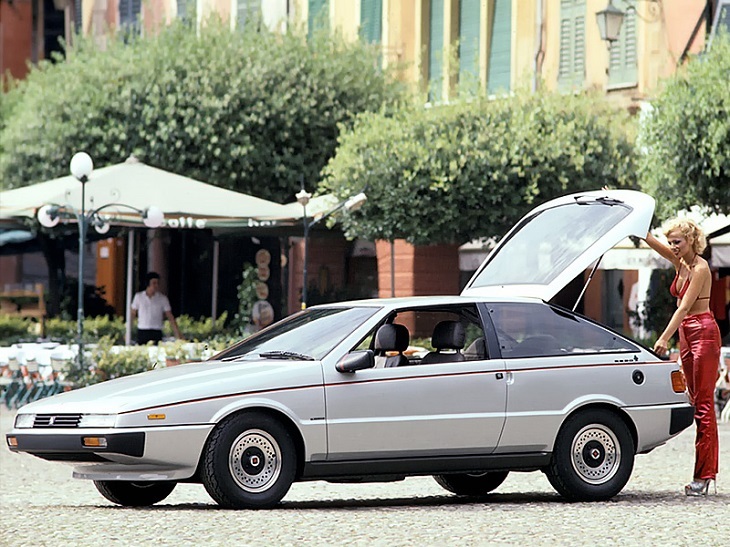 This led Giugiaro to design a door where the sheet metal wraps round and covers the B-pillar and roof/side connection, thus giving rise to integral (otherwise referred to as wrapping or limousine) doors. The same treatment was given to the hatch, which covers the C-pillar, bending around to meet the glass of the second back window which incorporated another guttering strip. As far as shape is concerned, Giugiaro also came to this choice through the need to simplify the graphic breakdown of the form. Up to then, A-pillars had been characterized by six elements: Windshield seal, A-pillar, drip channel, door cut, door frame, and side window seal. If the windows called for the addition of trim strips, the number then grew to eight. With limousine doors, it was visually reduced to three: windshield strip, A-pillar (which is part of the door; the door cut disappears from view because the door frame “knocks” directly against the rubber of the strip), and the side window strip. Freed from the protuberance of the drip channel, the roof also became a clean surface. Giugiaro’s need for severe geometrical forms led him also to “hide” the other two necessary cuts on the car: those of the engine hood and hatch. Eighty millimetres beneath the belt-line, the designer drew a slight groove, painted red, that wrapped totally around the car. The cut to the engine hood (that folds over onto the side) and that of the far end of the hatch “fall” into this groove and drop from sight. 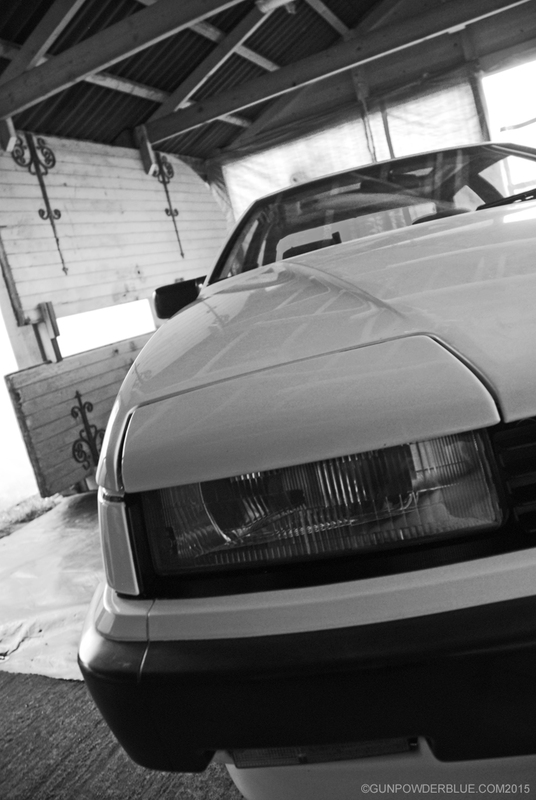 The result is a car boasting an impeccably clean shape. In side view, the B-pillar creates a continuous glazed surface area that, thanks to the highly elongated back side window, giving extra dynamism and elegance to the whole form. The very penetrating front end proposes an unusual lighting feature: fixed, semi-concealed headlights with movable lids so that the lights can be flashed during the day without having to move the lid or fit out the car with additional lights. The lids and related motor are built onto the hood. Standing out in the rather classically laid out interior is the steering wheel-instrumentation unit, quite a courageous move. 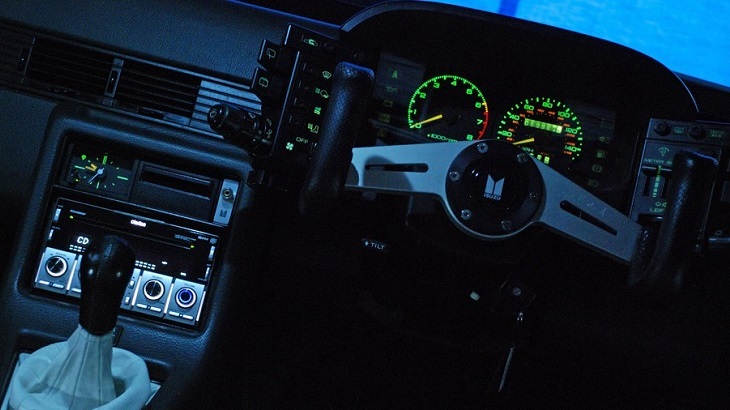 The aim was to enable the driver to operate all the controls by keeping a thumb grip on the wheel and moving just the other fingers like on a piano keyboard. The controls housed on the two satellites that pivot on a vertical axis and may be adjusted to each particular drivers build. The steering wheel is fitted with two thumb rests on the inside of the rim, which make for a safer grip and a relaxing support during long journeys. The triptych binnacle-and-pods assembled in a ‘club’ formation are what the ‘Asso di Fiori’ owes its name to.